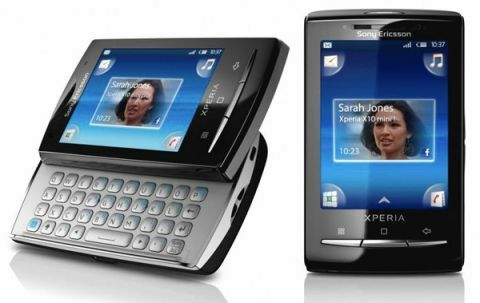 UPDATE: We've now published our test of the X10 Mini Pro's successor - so check out the more efficiently-monikered Sony Ericsson Xperia Mini Pro review. The Xperia X10 Mini Pro has recently been updated to Android 2.1, with Sony Ericsson finally getting around to modernising the antiquated Android 1.6 OS that powered the little Android QWERTY phone when it launched last year. The changes are slight, but with an improved web browser, more Bluetooth connectivity and enhanced social network integration, the X10 Mini Pro is certainly a better phone with the update than it was when it first launched. But is an upgrade to the already-outdated Android 2.1 enough to stay competitive in the cut-throat Android scene of 2011? Read on to see what difference Android 2.1 has made to this sweet little phone. You might get a slight sense of déja vu while reading this review of the Sony Ericsson Xperia X10 Mini Pro – because it's virtually the same phone as the extremely nice little Xperia X10 Mini we reviewed previously. Only there's one rather obvious and glaring change – the addition of a slide-out QWERTY keyboard that's been bolted onto the underside of the X10 Mini Pro, for the benefit of those yet to take the brave leap into entirely touch-based mobile phone operation. Amazingly, the Sony Ericsson Xperia X10 Mini Pro manages to remain the same physical size as the non-QWERTY X10 Mini – which leads us to presume the X10 Mini was filled with plenty of foam padding to make it bigger than actually necessary. The Xperia X10 Mini Pro's QWERTY keyboard adds extra weight to the phone, giving us a handset that feels much heavier than the slightly lightweight X10 Mini, which somehow tricks the brain into thinking it's a more solid, high quality device. It's lovely in the hand. People will pass it around in admiration. The keyboard flips out with a heavy clunk and is backlit, with light twinkling out through its keys to guide your thumbs when the automatic sensor thinks it's dark enough for you to need a bit of help finding the right buttons. The keyboard is solid, doesn't bend or flex, and while it's obviously a little cramped given the minuscule nature of the phone itself, there's enough of a gap between the slightly raised buttons to ensure typing is possible to a good degree of accuracy. There's actually a pretty big internal difference between this and the X10 Mini – the Mini Pro features a removable battery, while the regular X10 Mini's came sealed into its case. The Mini Pro's battery offers a rather tiny 930mAh capacity – but you wouldn't know it. It lasts for ages. The USB connector has been placed along the side of the phone so it pokes out between your hands when you've got it connected, meaning it's easy to hold the phone easily when it's plugged in – nice thinking there, Sony Ericsson boffins. The 3.5mm headphone jack and power/lock button sit on the top edge. There's a custom button for the camera along the right-hand edge, beneath the rocker button for volume. As with the X10 Mini, there's no optical button or trackpad. The QWERTY keyboard has a left and right cursor button placed either side of its keyboard's space bar, enabling users to page quickly through typed messages to repair typos and save embarrassment. Inside the box came the phone, battery, charger, USB cable, 2GB micro SD card and charger. And you're ready to go.